The team delivered many needed supplies as well as a check for $13,000 to continue construction of a home at the Constanza orphanage. While in the Dominican Republic, the group worked at the Kids Alive International Care Center in Caraballo constructing a cinder block wall that borders the perimeter of the center’s property. They brought along a shell craft for each of the 250 children the center sees each day. The group visited the Kids Alive Care center and orphanage in Constanza. 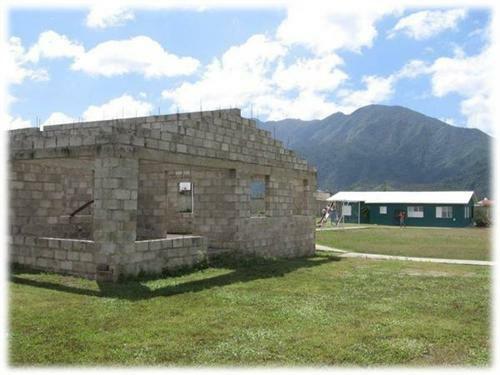 At that site, the Rotary Club of Wheaton presented a check to Kids Alive International for $13,000, part of a $20,000 fundraising initiative, to finish the construction of a home for orphans (shown in this image). The home currently has walls and has not been worked on since 2005, as other projects have been a priority. Once completed, the building will house 10 orphans and their “house” parents. The group also traveled to Jarabacoa where they met with the Rotary Club of Jarabacoa. The two clubs have submitted a matching grant to the Rotary Foundation to furnish the orphan home in Constanza once the building is complete.